Whale watching close to Christchurch, along the north-eastern coastline of New Zealand's South Island, has become a popular attraction for visitors and locals. There are several highly regarded whale watching tours nearby in the town of Kaikoura, which can be reached in around 2.5 hours from central Christchurch. Kaikoura is known as one of the best places for whale watching in the whole of New Zealand and is a popular excursion from Christchurch. Regular boat trips from harbours near to Christchurch's provide some extraordinary views of huge, friendly sperm whales, which are generally seen alone due to their large feeding area. 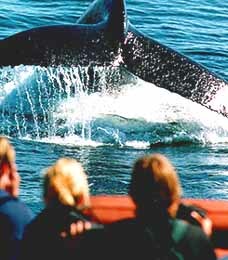 The whale-spotting success rate around Christchurch and Kaikoura is extremely high, although very dependent upon weather conditions. Whale-watching boats share their information with each other to improve the chances of sighting sperm whales around Christchurch and Kaikoura. The whale watching boats in Kaikoura vary greatly in size and shape, with viewing decks, interesting commentary and refreshments. An increasingly popular alternative to Christchurch whale watching boat tours are whale watching flights, which provide striking aerial views of the whales, with small planes departing from the nearby Kaikoura Airfield. Sperm whales are the largest of the great toothed whales and adult male sperm whales can measure more than to 20 metres / 32 feet, weighing a staggering 50 tonnes, although female sperm whales are considerably smaller. This protected species of whale lives for up to 70 years and dives for around 45 minutes. 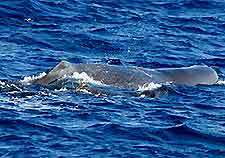 Sperm whales can often be seen around Kaikoura and other nearby areas of New Zealand's South Island between October to August. 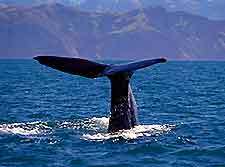 One of the major tourist attractions and activities on the outskirts of Christchurch, regular whale watching boat tours depart from areas around Kaikoura and should generally be booked in advance. The Kaikoura whale watching boat trips, nearby Christchurch, are able to get close enough to the sperm whales to observe them in great detail and photo opportunities are plentiful during the whale watching cruises. However, there are extremely strict whale watching rules in New Zealand, which include no swimming, feeding or touching of the sperm whales. Also, marine vessels around Christchurch and Kaikoura should always maintain a reasonable distance from the whale and be sure not to cause it any distress. Other whale species can sometimes be seen in the Christchurch area, such as southern right whales, humpback whales and pilot whales, together with dusky dolphins, fur seals and other sea mammals.